I’m attending WordCamp NYC at Baruch College this weekend, where I’ll be presenting advanced WordPress APIs. I gave this talk at WordCamp Mid-Atlantic (check out the slides) but I’ve promised to mix it up quite a bit for the New York crowd. That means new functions, new use cases, new plugins. From my speaker proposal: “This talk will be high tempo, engaging, challenging, and fun. The goal is to expose the potential of WordPress to new, skeptical, or even advanced developers. While a high-level talk, beginning developers are sure to find inspiration. Advanced individuals new to WordPress development, or considering WP for their next project, will ideally be convinced it is a worthy development tool.” Woo. I also plan to hold an unconference session on contributing to WordPress. I have it on good authority that I may also be confined to a room at one point to work on WordPress 3.1 feature development with Aaron Jorbin, Daryl Koopersmith, Matt Martz, and others. Which sounds awesome. You know what else is awesome? The lineup of speakers, a bunch of whom I’ll be meeting for the first time. 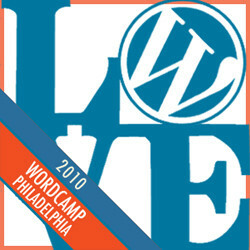 On Saturday, October 30, I was asked to present what’s next for WordPress at WordCamp Philly. In this shared session, I’ll be able to talk about WordPress 3.1 with a lot more substance than I had at WordCamp Birmingham last month, as we expect to freeze feature development next week. Check out the program and speakers. A few more meetups this month — I was at WordCamp Raleigh last week, DC PHP last night, and I’ll be at the joint WordPress DC — Hacks/Hackers meetup next week at NPR. (We’ll be hearing about the Argo Network, which I’m really excited about.) I also attended Accessibility Camp DC over the weekend, which was quite an experience, and I’ll be writing more about that in the future. As part of my WordCamp Mid-Atlantic presentation on advanced WordPress APIs, here’s a list of resources for each API I’ve discussed. Slides and descriptions of each API are after the jump.